I can’t believe that it has been more than two months since I last posted! Actually, I can. It’s been a while since I’ve felt the urge to bake and even longer since I’ve had the motivation to blog about something I’ve baked. While I’ve been busy and am trying my best to get vaguely healthy again and blah blah blah, I think it’s also time for me to admit that this blog has, unfortunately, run its course. I didn’t really know where this blog was going to go when I started it in February 2012 – I’d started to bake quite regularly and wanted somewhere to deposit my recipes and have some sort of record of what worked and what didn’t. I’ve definitely succeeded in that respect; I refer back to my blog when I’m baking or cooking more than I thought I would five years later! I’ve never wanted to make money, or even build a massive following for the blog (although it’s been so gratifying to see the visits grow month by month, with people from all over the world looking up recipes!). Now that I’m baking a lot less often than I used to – although I still cook a fair bit – and the world of food blogging has moved on considerably in the last five years, I think it’s time to hang up the, er, laptop. I’m in the process of moving the site back to my old URL – theveryhungrybaker.wordpress.com – so none of my posts will disappear; they’ll just have a new URL. Who knows, I might even keep posting there every now and then if I come up some fantastic new recipes! If you want to keep track of what I make anyway, whether it’s from a new recipe or something that’s already out there, please do follow me on Instagram where I’ll keep posting photos of things that I make. You can also keep an eye on the baking and cooking recipes that interest me by following me on Pinterest. That’s about it. I do feel a bit sad about scaling back the blog, but it does feel like the right time. Thank you so much for reading and commenting on my posts and, most of all, making my recipes! It has meant a lot to me. I can’t believe it’s been over 5 weeks since I last posted! Did you miss me?! I haven’t been away or anything – just lazy about updating the blog, and I also seem to keep losing time to playing Zelda: Breath of the Wild (it’s seriously, seriously great). This is a Mary Berry recipe (of course) that is very similar to the coffee and walnut cake recipe used on Bake Off a while ago. The only difference is that this is a single layer traybake as opposed to a two-layer round cake. The recipe calls for coffee essence, which I’d never heard of and couldn’t find in the supermarket, so I made up a small quantity of very very strong coffee instead, and stirred that in. The coffee flavour ended up being somewhat subtle, but it didn’t seem to matter because the sponge was just beautiful – exceedingly light and fluffy and very more-ish. It didn’t last long, I can tell you! I had a strangely specific urge for exceedingly chocolatey flapjacks a couple of weeks ago, so I dug around the internet until I found this recipe. I tinkered with the recipe a little by pouring the melted chocolate on top of the flapjacks instead of dipping each one into it. I also (rather randomly) chopped up a couple of Penguin bars and threw them into the flapjack mix for extra crunch and chocolateyness. 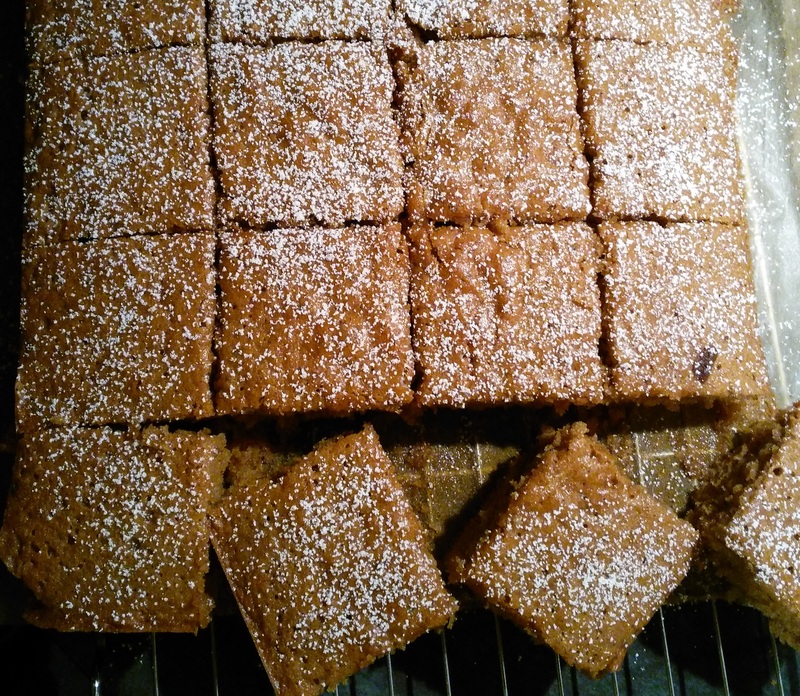 The flapjacks ended up slightly overbaked, but they were still delicious! I can’t say I particularly noticed the Penguin bits in there, but I’m sure they didn’t hurt. Confession: I made this so long ago that I have no idea where I got the recipe from – sorry! However, it was pretty straightforward and very similar to pretty much any other upside down cake. The cake itself contained ground almonds, which added a nice summery flavour to the proceedings. It was a delicious cake; I only wish I could remember the recipe so I can make it again…! My husband and I (mainly my husband!) made this for a Moroccan-themed meal at his mum’s house recently. Also known as m’hanncha, snake pie is basically a lot of filo stuffed with a sugary, buttery, almondy mix that is then rolled up and coiled around to form a ‘snake’, before baking. It was a little labour-intensive and there was a panic when the pie started leaking in the oven, but it turned out really well and was warmly received by all! The recipe is a Jamie Oliver one and can be found here. 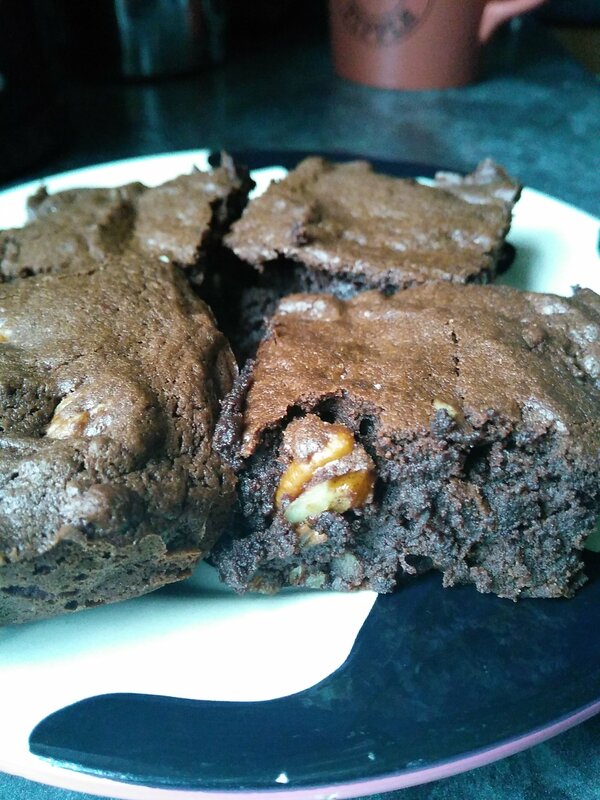 I made these bourbon pecan brownies quite a while ago, now, so apologies for the brief nature of this post! I decided to make these when I was idly flicking through Dan Lepard’s excellent Short and Sweet baking recipe book and remembered that my husband had recently acquired some rather nice bourbon. Lepard says you can make these without the booze, but that’s not something I can really understand! The brownies were pretty easy to make, especially as I ignored Lepard’s instruction to sift the flour and cocoa twice and only did it once (rebel or what? ), because, you know, life’s too short. The cooking time was spot on for the perfect brownie texture – slightly crisp on top and round the edges, but delectably gooey in the middle. 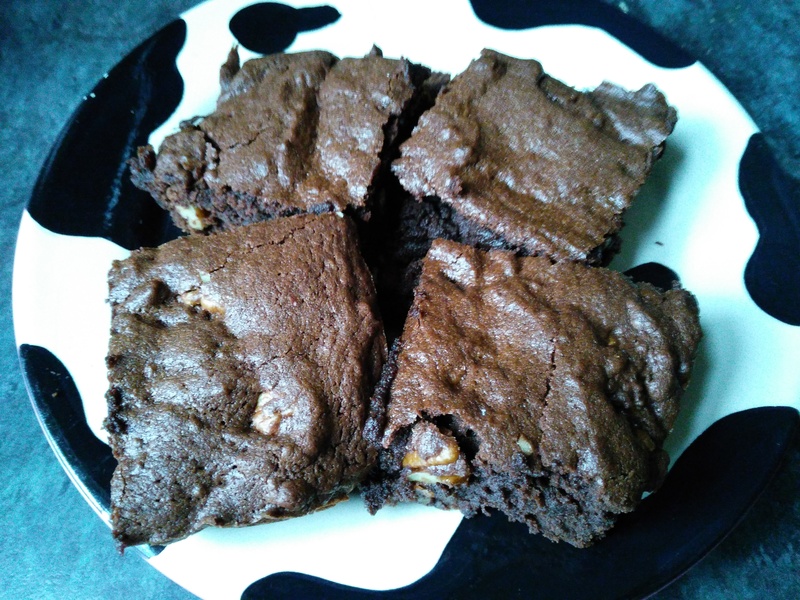 I have to say, you can really taste the booze in these brownies – which is nice, because I’ve fallen foul of many a recipe involving booze where you can’t really taste the alcoholic element, which is always a shame (and a waste of good booze!). There’s a good chocolate flavour, too, especially if you use the decent dark stuff with at least 70% cocoa solids. You can find the recipe online here, but I do urge you to check out Short and Sweet if you’re in the market for a good baking book. The bread recipes I’ve tried are excellent (I’ve made his pitta recipe many times), and the sweet bakes are all fantastic with some great flavours, and not too difficult to throw together. This Moroccan-style chickpea and red lentil stew with harissa, lemon and mint couscous is something I’ve made a few times before, so I thought it was about time that I recorded the recipe in some way so that my husband can make it for me every so often. I’m not sure how genuinely Moroccan it really is, but the combination of spices is something I’ve come across in other Moroccan recipes before, so I’ll tentatively say that it’s in the style of an authentic Moroccan chickpea stew, if I may. It’s really easy to make, especially if you get the stew started then prepare the couscous so that it ‘cooks’ in its own steam while the stew is simmering away. 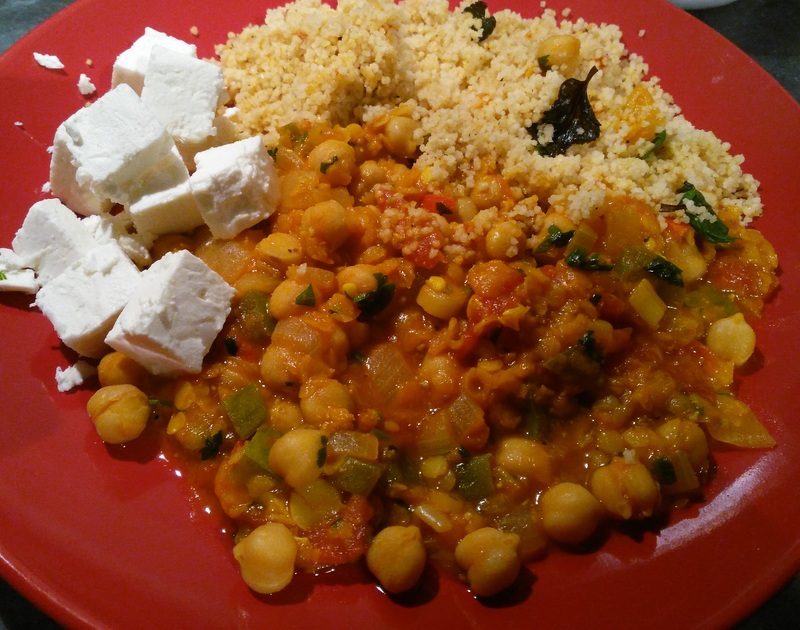 Then all you have to do is prepare your cheese of choice – I used feta here but I actually usually serve the stew with halloumi – and away you go! Heat the oil in a saucepan. Cook the onions and peppers until soft. Add the garlic and fresh chilli and cook for a couple of minutes. Add the tomatoes and spices. Simmer for a few minutes. Add the red lentils, chickpeas and enough water to cover everything. Bring to the boil, then lower the heat and cover the pan with a lid. Cook for around 20 minutes, or until the red lentils are soft, stirring occasionally and adding more water if required. While the stew is cooking, prepare the couscous by placing it in a heatproof bowl and adding the harissa, lemon zest, mint and seasoning. You can also add a little olive oil if you like. Add enough boiling water to just about cover the couscous, then cover the bowl with a plate and leave to one side. Add the lemon juice, coriander or parsley and seasoning to the stew, and stir well. Take the stew off the heat. 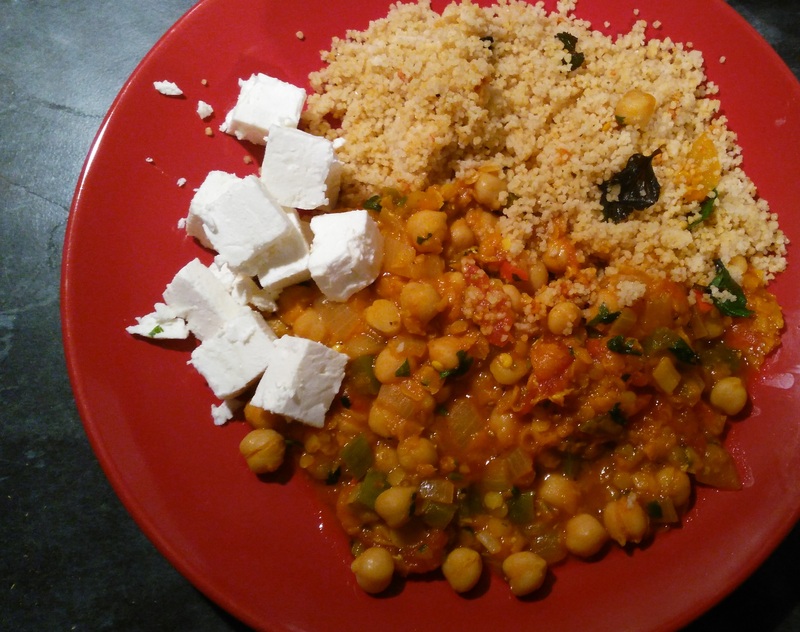 Fluff up the couscous with a fork and serve alongside the stew and the cheese of your choice. Tip: to cook halloumi to perfection, simply cut it up into thick slices, heat a frying pan until very hot, then add the halloumi and fry it for 1-2 mins, or until brown underneath. Flip each slice over and cook for another 1-2 minutes until brown on the other side. That’s it! Don’t cook it in oil – this seems to take away the slightly crisp texture. Well, it’s been rather longer since my last post than I originally anticipated! But I have been baking, so fear not. My first bake of 2017 was this rather delicious masala chai cake. The recipe is from The Cardamom Trail, the book by one of my all-time favourite GBBO contestants, Chetna Makan. 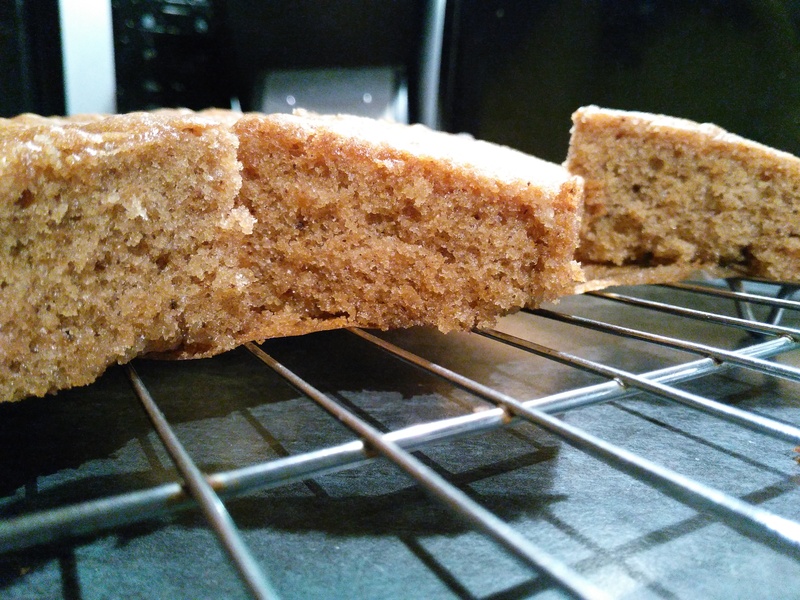 It’s a lot simpler than the recipe I came up for my own sort-of successful tea masala cake five years (!) ago – and a lot more successful at replicating the flavours of traditional Indian chai, too. I’m a huge fan of Chetna’s recipes – they’re usually not too complicated, but they still deliver on both the flavour and texture fronts every time. This masala chai cake recipe is no exception; the sponge is beautifully soft and light, while the gorgeous combination of cardamom, cloves, cinnamon and ginger really comes through. I chose not to make the frosting because, like many other people, I’ve been trying to eat a little less fat and sugar in the aftermath of the excesses of Christmas. I think the cake is beautiful without the frosting, but I can also see how it would add a bit more oomph if you were making the cake for a less diet-conscious crowd. Without the frosting, the cake comes in at around 150 calories per piece if you cut it into 20 pieces, which I think is very reasonable for such a delicious cake! The recipe isn’t online, but I would strongly recommend that anyone who’s a fan of using spices in baking buy The Cardamom Trail – it’s a fantastic book and I can’t wait to make something else from it! It’s been quiet round here, hasn’t it?! 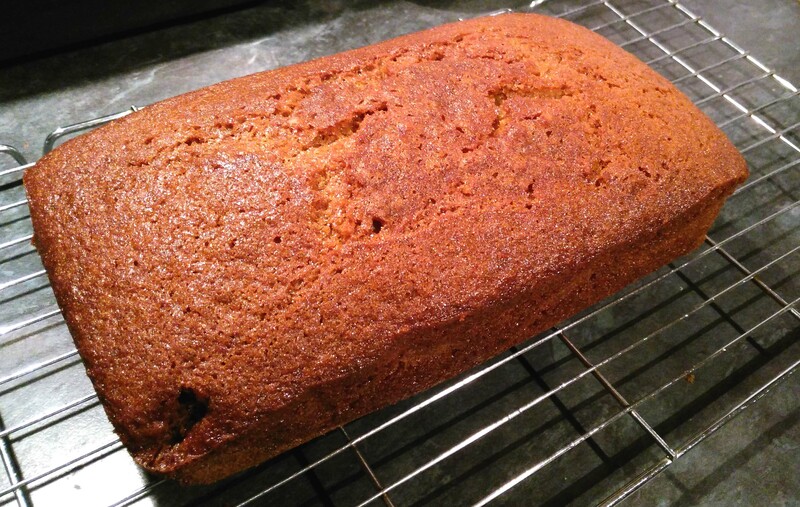 I haven’t really baked much recently apart from a couple of batches of mince pies and this rather lovely golden syrup loaf cake. But we went to Lisbon at the start of the month, so I’ll probably be making Portuguese custard tarts again some time soon! Anyway. 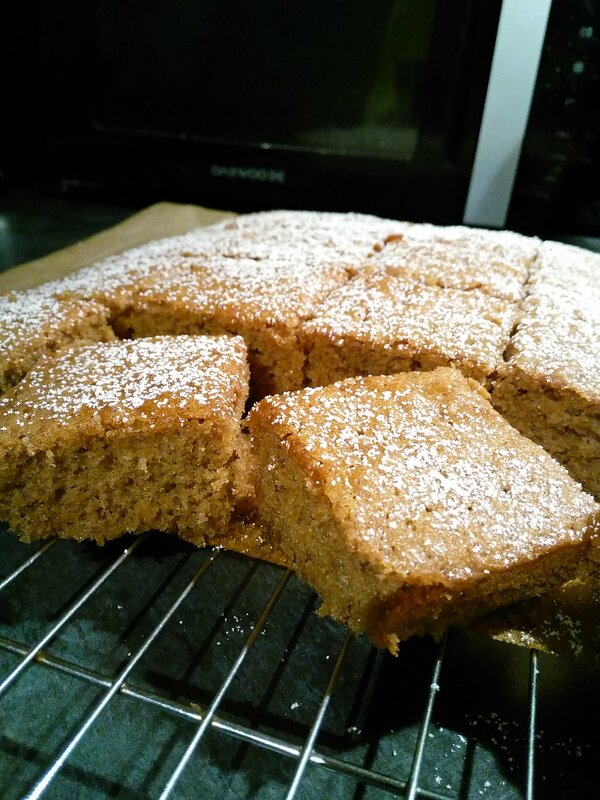 I saw the recipe for this golden syrup cake on Twitter, when Ruby Tandoh (whose recipe it is) tweeted that she’d made it recently and that it was amazing. 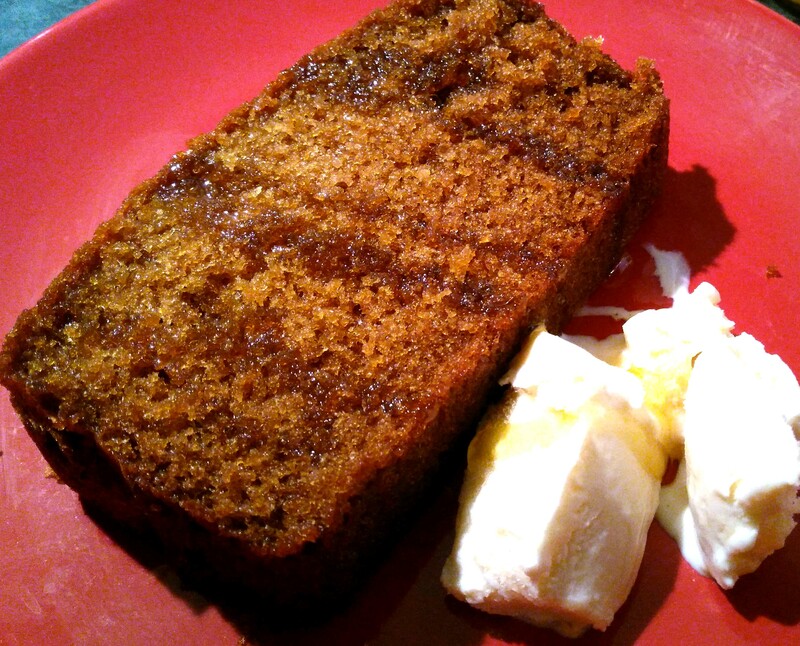 I decided to make it on the spot – golden syrup has such a gorgeous flavour, but it’s usually combined with other things like spices and black treacle, so making a cake where it’s the star of the show really appealed to me. The cake was very easy to make and even baked in the appropriate amount of time (shock, horror)! We immediately had it warm with ice cream as per the picture below, but we found it was just as delicious cold on its own. It really didn’t last that long! It’s such a simple bake, but all the more tasty for it. I’d really recommend the recipe if you want something easy yet comforting in the colder months, and fancy a change from all the spices and booze of the festive period. I’m not sure if I’ll be posting again this year, so I’ll take the opportunity to wish you all a very merry Christmas and a happy new year! I’m looking forward to spending the holiday with my husband (!) (yes, it’s still a novelty), reading a lot, baking a bit, and generally relaxing. I hope it’s a good one for you too.